Heavy industry has a reputation for being big, bulky and dirty. Some assume it’s mainly mechanical and that there’s really no place for digital innovation. But that assumption is wrong. It’s true that the digital revolution started with software and services, but now heavy industries are also embracing its power. In fact, some of the most promising value-adding opportunities for digital innovation lie in heavy industry. Potential benefits include predictive maintenance, better scheduling and planning, and reduced risk for employees… just to name a few. However, the shift is not without its challenges. Change is always hard, and there’s no guarantee of success. Research shows that as many as 84 percent of digital transformation projects fail to launch. And heavy industry companies may be at even higher risk, as the industry tends to be particularly prone to challenges with inertia, a lack of expertise, and finding a balance between innovation and stability. Despite the risks, those in heavy industry (and really any sector) don’t have a choice. They have to adopt digital innovation in order to survive. Consumer expectations and the advent of connected devices and platforms demand it. Additionally, research shows that only 5 percent of manufacturing executives are satisfied with their current digital strategies. This change the marketplace is demanding is called Industry 4.0, a term that generally represents the vision that all equipment is online, interconnected, and in some way intelligent enough to make its own decisions. In a recent global survey, nearly nine in ten executives reported that they believe their companies have two years or less to make significant progress in digital transformation before they begin to suffer financially. Moreover, 59 percent think it may already be too late to avoid falling behind competitors. Furthermore, it is expected that in the next few years, digital disruptors could displace up to 40 percent of incumbent companies. To protect their market share, many businesses will have to rethink both how they measure up to their competitors and how they monitor the needs and desires of their customers. Transitioning to Industry 4.0 isn’t an option; it’s a necessity. So what does that look like in the heavy manufacturing sector? You might be surprised. Here is just a glimpse into what digital innovation is making possible. Perhaps the biggest change of Industry 4.0 is the shift from mass production to mass customization. Before, the idea of customizing a million products for a million consumers seemed impossible because of the cost and time involved. Now, because of digital innovation, it is just as efficient to produce customized products than it is to produce batches. Car manufacturing is a great example of this. Buyers can now choose from an abundance of customizable options, even on entry-level vehicles. It’s no longer just about color options but about technology, screen size, built in Wi-Fi, wireless charging, and more. It can be done, even at small volumes, through the power of next generation manufacturing. The same is true in shipbuilding, as owners’ specifications increase with technological advancements. One company that is helping change the course in one of the oldest and most traditional heaving manufacturing areas is Hyundai Heavy Industries (HHI), the largest shipbuilder and global market leader. Many other shipyards have shut down due to over-capacity, but HHI has remained competitive through the adoption of digital technologies. The company has adopted a solution that communicates critical design changes to the right individuals at the right time, resulting in cost savings upwards of 15 percent. Additionally, by tracking data in a centralized system, it has been able to leverage advancements in predictive analytics to simulate different scenarios that help improve the design process—improving affordability and efficiency. Most heavy industry companies have significant operational data available to them. Another aspect of Industry 4.0 is advanced data analytics that can help companies learn from and make decisions based on the data they already have. It can inform sales decisions, identify underlying drivers of manufacturing performance, and enable real-time control performance. However, such data must be available to those who need it most—hence the importance of making real-time data available remotely to employees who operate in the field. These may be sales representatives who spend most of their time in a territory or drivers who transport products from point A to point B. In order to operate competitively, efficiently and effectively, real-time data must be available to these critical extensions of a company. There’s also a benefit in using data for predictive maintenance and to improve asset reliability. Two examples are vehicles that can track gas usage and engine health, and manufacturing machinery that can predict failure and maintenance needs. This in itself has the potential to save manufacturers millions of dollars per year. However, the use of data analytics to increase asset reliability has so far fallen short of expectations. That’s because industrial operations tend to lack the quantities of data needed to apply these predictive-maintenance techniques, or if they have it, it is too segmented to provide real insight. And at this point, it is often the case that large assets do not fail often, and that it is more cost-effective to simply replace small assets. Conclusion: Transitioning to Industry 4.0 isn’t an option; it’s a necessity. 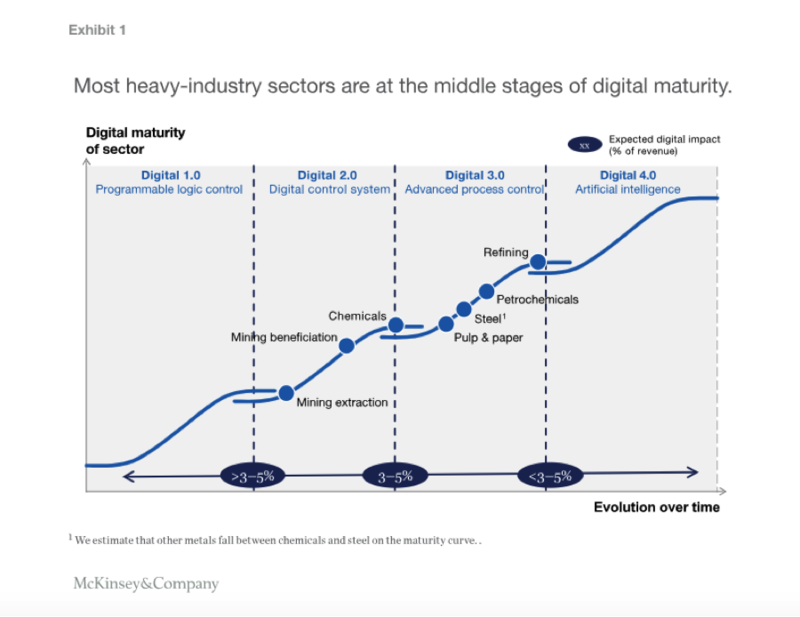 The reality is, a lot of heavy industry companies have already implemented digital innovation into their operations and are reaping the rewards. If you need more proof, these case studies covering sectors from logging industry, to transportation, to automotive tires show that industry 4.0 can make an impact in your business here and now.